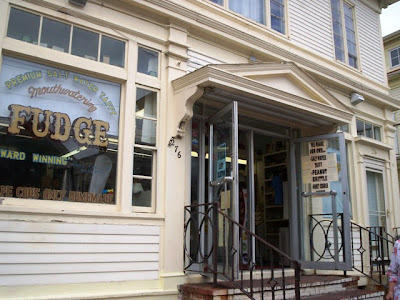 Prior to having lunch at Provincetown's famous Lobster Pot, Mom and I decided to stop in at one of Commercial Street's many fudge shops to buy some - what else - fudge. 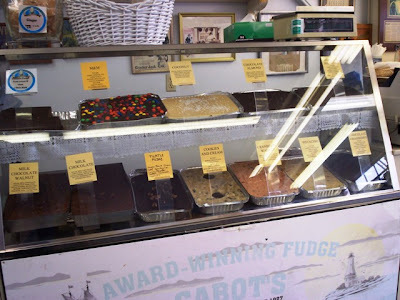 Mom and I just love homemade fudge, so when we saw Cabot's Candy Store bustling with tourists, we decided that this store must be "the place to be." We walked up the stairs and into the store at about 1:10 p.m.
Cabot's is very cute inside! 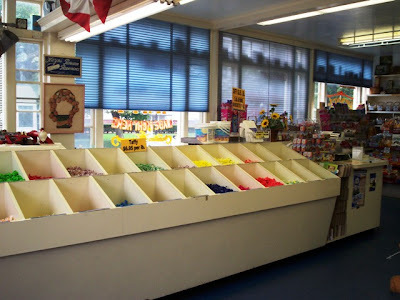 Not only does it have two counters displaying their fudge, but they have several bins of various candies and snacks scattered throughout the store. They also have several varieties of nostalgia candy which we always like to see. Mom stood at the fudge counter and was waited on by a very polite gentleman. She chose to get a pound of fudge ($10.95/lb. ), and he told her that he could either give her a pound of one flavor, or she can pick little squares of several flavors so that we could try them all. 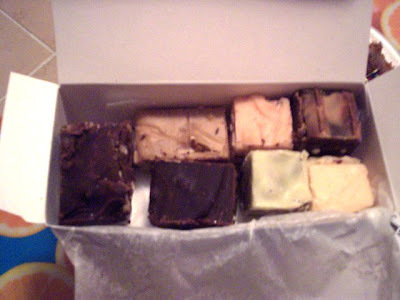 From all the different fudges, Mom chose the cranberry walnut, chocolate cranberry, pistachio, penuche, chocolate peanut butter, coconut, and rocky road (my favorite). After putting the box on the scale, the total came to $10.62. The man behind the counter provided us with napkins and plastic knives in case we wanted to try the fudge immediately. Since we were heading off to have lunch, we decided to wait until we got home to try the very aromatic candy. When we got home, Mom and I cut little slivers of each piece of fudge and laid them out on a plate. The fudge had a nice, creamy texture and was easy to slice. Unfortunately, although there was a large assortment of flavors, we found that they didn't live up to their potential. All seven fudges weren't as flavorful as they could have been. We barely tasted the cranberries in the fudge, even though it was sprinkled with actual cranberries. The chocolate peanut butter didn't really taste like chocolate or peanut butter. It wasn't a bad taste, but it wasn't as dynamic as we thought it would be. The feel of the fudge, however, was excellent. It did not break apart and was not overly sweet. If the taste of the fudge was stronger and the texture stayed just as it was, Cabot's would be fantastic. 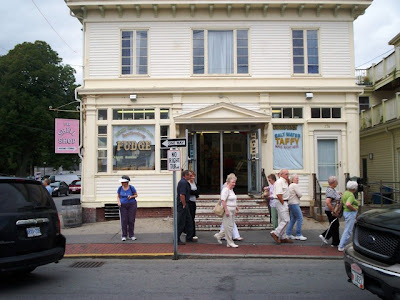 Open since 1927, Cabot's makes gourmet salt water taffy, sugar free taffy, fudge, peanut brittle, and honey crunch popcorn from scratch. 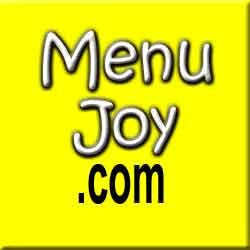 They also sell their goods both retail and wholesale. Although Mom and I did enjoy the fudge, we felt that it could have been a little tastier. However, this experience will not deter us from ever having Cabot's fudge again. Perhaps we'll stop in the next time we're in Provincetown. The shop was adorable, and we can see why it has been so popular for over 80 years. 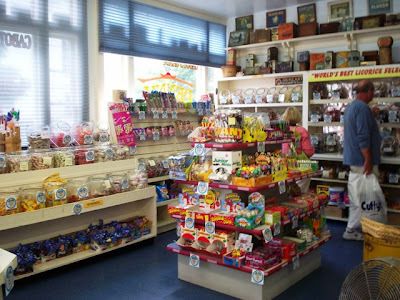 Cabot's Candy Store is open daily from 10 a.m. to 6 p.m. all year. During the winter, please call for hours as they may not be open every day.